OXFORD, Miss. 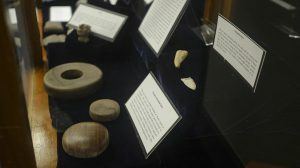 – University of Mississippi anthropology students have curated an exhibit of stone artifacts that are on display at the J.D. Williams Library. The exhibit features a grasshopper effigy bead, arrowheads, chunky stones, axes and a ceramic human effigy from the Calvin S. Brown Collection, managed by the university’s Center for Archaeological Research. Brown, a modern languages professor at UM in the early 1900s, acquired objects from archaeological sites across the state for the university. The curated objects are in a display case in the reading room of the library’s Department of Archives and Special Collections. The exhibit will remain through the summer. Students curated the exhibit during the fall semester as part of Anthropology 309: Archaeology of the Southeast and Mississippi. They chose each object to display, worked on descriptions for each and designed the display. Maureen Meyers, assistant professor of anthropology, taught the course to give students a more hands-on learning experience. The items on display span 10,000 years of native life in Mississippi. Ford and Meyers presented the students with information about how to create an engaging exhibit by telling stories and making people want to learn more. Brandon Fassinger, a senior from Phoenix who is double majoring in history and anthropology, said he enjoyed how the course incorporated real archaeological work in a classroom setting. Students worked in the archaeology lab when not in the classroom to determine the use and function of the artifacts that would eventually be in the exhibit. Fassinger and his classmates used digital scales and calipers to precisely determine the dimensions and weight of each artifact. “This part was really my favorite because it was really hands-on and engaging,” he said. The students then decided which pieces represented cultural aspects of Mississippian society to put on display. Fassinger said the experience gave him extensive knowledge of Southeastern archaeology and ancient Native American people and was a major factor in his decision to add anthropology as a second major. For more information on research, educational and outreach programs in archaeology at Ole Miss, visit http://car.olemiss.edu.